It measures 3.5cm x 3.5cm and is made of three layers of glass. 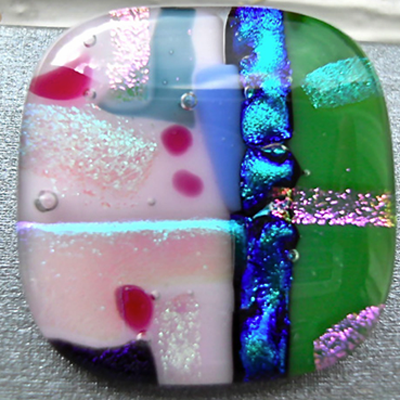 A bottom layer of pieces of Pale Pink opaque glass, textured Turquoise/Purple Dichroic glass and Green glass. Then a layer of many different coloured pieces of Dichroic glass all topped with a layer of clear glass.